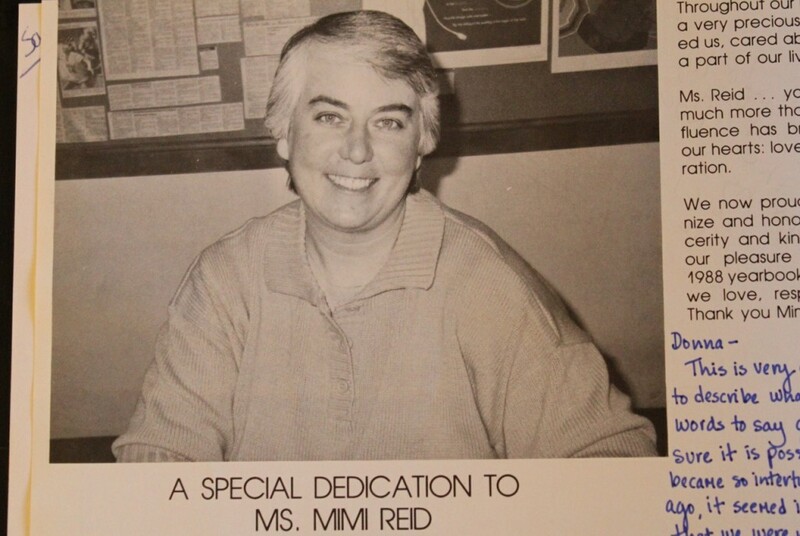 The Hadley-Luzerne Class of 1988 dedicated our yearbook to our English teacher, our mentor, our friend Mimi Reid. hahaha, Sissy — how did I know you would say something like that!? But you can see Grandma doing the same thing I did, right? Love Ms. Reid…she was one of my very favorite teachers…she always made EVERYONE feel like they mattered. :o) Thanks for writing about her! My pleasure, Laura. She brought so much to all of our lives. Donna, I wish that a had known that you had not seen Mimi and had not reconnected with her. I have contact with her and would have gladly gotten the two of you together. ONLY IF I HAD KNOWN!!! So glad to hear that you have reunited!!! Haha… evidently I wouldn’t make a very good detective!! Thanks so much for reading and commenting. There are NO COINCIDENCES, ONLY SMALL MIRACLES. And it’s not lost on me that this is your 88th post. What a wonderful thing to finally reconnect after all these years. Mimi is an amazing woman and touched all our lives in so many ways, she was far more than an English teacher, and we are blessed to have had us in our lives, something you know far to well, Thanks again for sharing. Truly a wonderful thing! We are indeed blessed to have had her and so many wonderful and amazing teachers at HLCS. Thanks for your comment, Dawnie.